Donations from fans like you help get us off campus to cover our sports teams, bring in the best local indie music, and provide cool swag to make your friends jealous. Choose your amount, then choose 'Other' for designation. 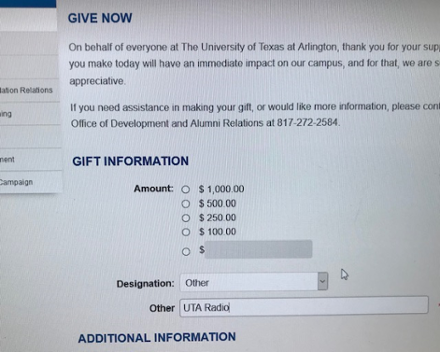 Once the 'Other" bar pops up, type in 'UTA Radio'. Easy! Copyright © 2018 UTA Radio.com. All rights reserved.